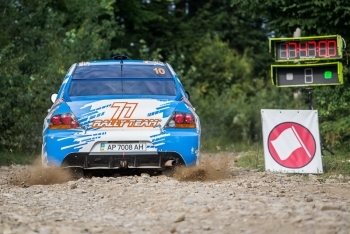 The first official day of Aleksandrov Rally, the IV round of the Ukrainian Championship, the XII round of European Cup and the VI round of the Russian Championship, was devoted to test runs and preliminary registration procedures for the teams and crews. Crews have passed a test path that will allow anyone to carry out a series of settings and adapt to the specifics of the upcoming race. This year, Aleksandrov Rally will offer drivers nearly 180 fighting kilometers along mountain roads and the foothills of the Carpathians, 65 teams from Ukraine, Russia and Belarus will compete in the most difficult gravel road of Ukraine. Today, August 15, is a special day for all the organizers of this race, participants, spectators and fans of the rally – today the outstanding athlete and engineer Andrey Aleksandrov would have turned 48 years old. "It is a great pleasure and honor for us, to meet the best Ukrainian athletes and visitors at the Championship especially on the Birthday of Andrey. This race has always been one of the most beloved rallies of Andrey, and we sincerely wish you all to enjoy this beautiful and challenging track. Good luck to everyone and see you at the finish line" – Oksana Aleksandrova. Tomorrow, Friday, the crews will be busy with the recce, as well as with technical inspections and administrative checks and later the official opening Ceremony will complete the day. The Ceremony will start at 20.00 at the Cathedral Square of Chernivtsi.